76. Rabbi Aleksandr Dukhovny has led the Progressive/Reform movement in Kyiv and Ukraine for 15 years. Within the past year, his congregation (known as Hatikvah) and the headquarters of the Progressive/Reform movement in Ukraine have moved into permanent, attractively designed and furnished program and office space in a renovated office building in Podil. The premises include a prayer hall seating 120 people, several large program rooms, a small youth center, a kosher kitchen, and offices. The complex is served by two modern elevators. The new premises, said Rabbi Dukhovny, have been "revolutionary" in that they have attracted many new people to the congregation. Between 30 and 50 people attend Saturday morning Shabbat services, after which a potluck lunch is served. The Shabbat lunch, the rabbi observed, has become a "major event." A "Sunday school" for children is held at the same time as Shabbat services on Saturday, thus educating children at the same time that adults worship in the prayer hall. These concurrent programs, followed by the potluck lunch, make Shabbat a real family experience. In response to a question, Rabbi Dukhovny said that Shabbat programs have been cancelled several times in fear of Russian-instigated antisemitic provocations. Congregants, he continued, are united in their support of a sovereign Ukraine, and many members were among the demonstrators on Maidan. Congregants pay dues on a scale reflecting their financial capacity. No one is turned away, and the congregation provides some assistance to those in need. Several individuals who are financially comfortable, stated Rabbi Dukhovny, have sponsored specific programs at the congregation. 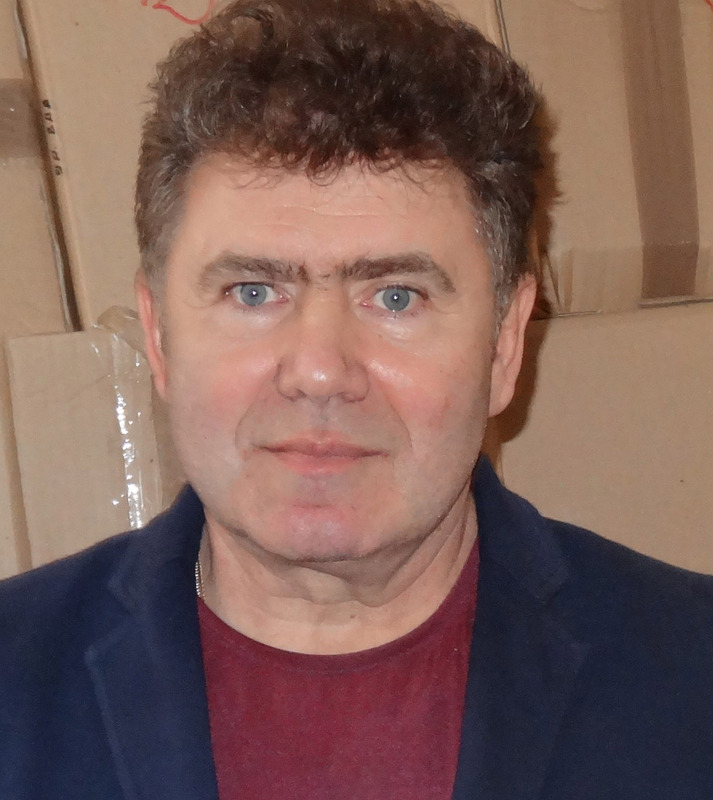 Rabbi Aleksandr Dukhovny, a native of Kyiv who trained for the rabbinate at the Leo Baeck Rabbinic Training Seminary in London, is seen at left in a 2013 photo. At right is the new prayer hall or sanctuary of Hatikvah Congregation in Kyiv. 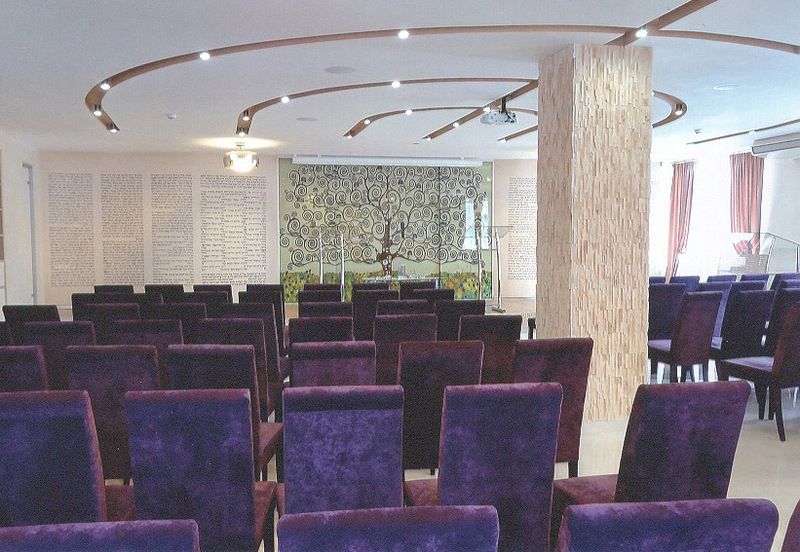 A modern depiction of the Tree of Life encloses the congregational Torahs. The premises of the congregation are so attractive and comfortable, said Rabbi Dukhovny, that both the Jewish Agency and the Joint Distribution Com-mittee have held events there. The building is well-served by public transportation. In addition to weekly worship services and the related Sunday school, Hatikvah operates several other programs. A Netzer youth group is overseeing the Bar/Bat Mitzvah of 13 youngsters this year; he had hoped for a larger number of teens in this program, said Rabbi Dukhovny, but the tense political situation has deterred many families from permitting the participation of their children in necessary preparatory study. Netzer offers leadership training to somewhat older teens, and holds special sessions twice weekly for young people 17 and older who want to be camp counselors. Kyiv youngsters will be among about 400 kids from all over the former Soviet Union who attend summer camp in the post-Soviet states, declared Rabbi Dukhovny. Among the most productive Jewish educational and community-building programs is a Shabbaton, Rabbi Dukhovny stated. Hatikvah is organizing such a Shabbaton for the end of May, he continued. He expects about 20 families to attend, most of whom have children enrolled in the Hatikvah Sunday school or in one of the two public preschools associated with the Progressive movement in Kyiv. Asked about the fate of three Progressive synagogue buildings in Crimea now that the peninsula had been occupied by Russia, Rabbi Dukhovny said that the three congregations - in Simferopol, Kerch, and Yevpatoria - now were without a rabbi as Rabbi Mikhail Kapustin had been forced to flee Crimea and subsequently accepted a position serving a Progressive congregation in Bratislava. Based in Simferopol, Rabbi Kapustin had traveled to the other congregations as well and had built up a strong Progressive presence in Crimea. However, he strongly condemned the Russian occupation and posted his views online. In response, his synagogue was vandalized and he was threatened with violence against his person. Fearing an attack, he left. Rabbi Dukhovny had spoken by telephone with remaining lay leaders in Crimea and found that some of them welcomed the Russian takeover, believing that their economic circumstances would improve when Crimea was absorbed by Russia. Rabbi Dukhovny admonished them that they would find themselves in a "golden cage" when Russian control was consolidated, but the most prominent leaders clearly favored Russian rule. The Progressive Judaism office in Kyiv sent the Crimean congregations matza for Pesach as well as new Russian-language hagadot, as they had planned to do before the Russian action, Rabbi Dukhovny said; the matza was accepted by Russian customs agents at the Crimean border and made available to local Jews because it was food, Rabbi Dukhovny said, but the hagadot were returned to the Kyiv office. 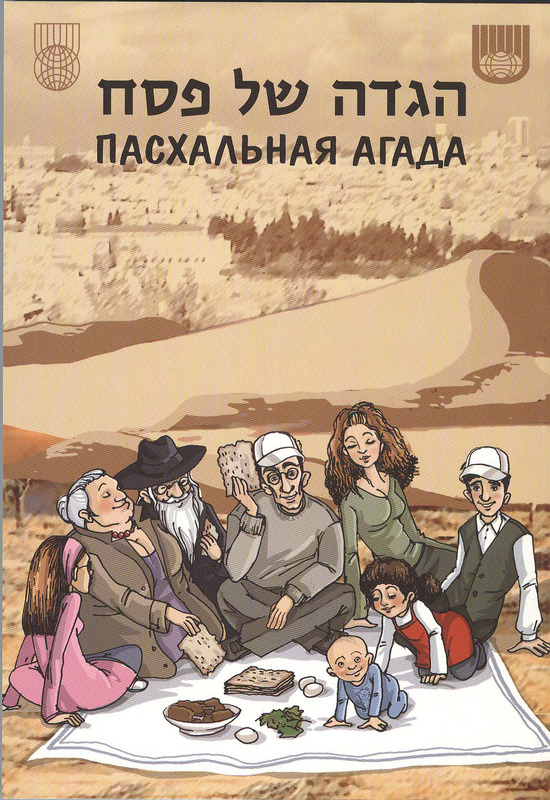 The bilingual hagada at right was published by the World Union for Progressive Judaism in 2007. It includes commentary and illus-trations. Russian customs officials would not permit its entry into Russian-occupied Crimea. Hagadah: World Union for Progressive Judaism. In all, said Rabbi Dukhovny, 47 Progressive Jewish congregations were formally registered in Ukraine; however, he continued only 16 of them were active, among them the three in Crimea. Without rabbinic leadership, the future of these three groups was in doubt. The Odesa congregation soon would grow stronger as a new Russian-speaking rabbi soon to be ordained at the Leo Baeck seminary in London was expected to assume its pulpit during the summer. Several Progressive congregations in western Ukraine are strong, said Rabbi Dukhov-ny, notwithstanding the absence of a Progressive rabbi in the area. He singled out Lutsk as particularly noteworthy; it controls an old four-story synagogue building that is the de facto Jewish center in town. This structure houses the JDC hesed and a small Orthodox group, in addition to the Progressive congregation. The Progressive congregation in Cherkasy, south of Kyiv on the Dnipr River, also does very well, Rabbi Dukhovny noted. 77. 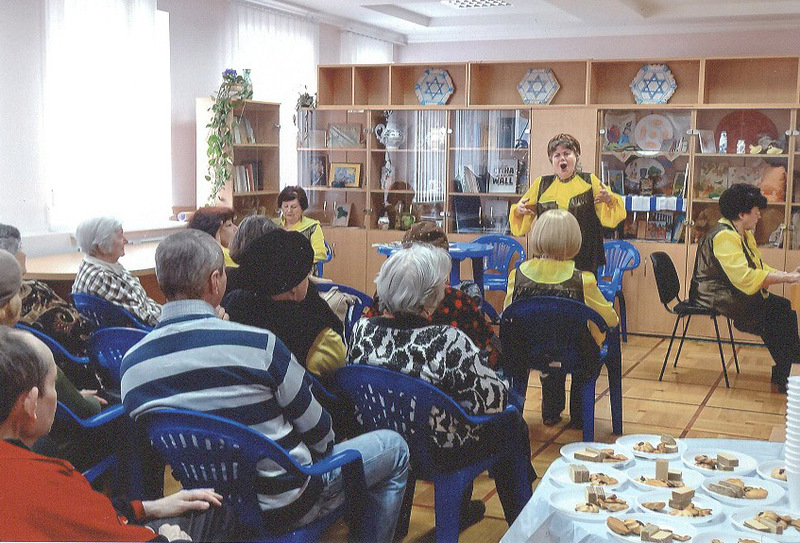 Hesed Azriel, operated by the American Jewish Joint Distribution Committee, is the primary provider of welfare services to Jews in Kyiv and the surrounding region. In the absence of executive staff, the writer met with Irina Yemets, deputy director of the hesed, and Natalya Nagornaya, who is responsible for program development in services for children, family, and the elderly. Several other hesed professionals also participated in the discussion. The meeting occurred in a conference room of a non-descript building into which the hesed had moved two months earlier. The previous building, a problem-prone structure atop a small hill in an area with poor public transportation, was undergoing significant reconstruction that required the transfer of hesed services to temporary premises. Hesed staff had been told, they said, that the old building would be ready for occupation by the end of 2014, but none of them believed that this timetable would be honored. When asked about the nature of the reconstruction, no one present was aware of specific plans. Some speculative discussion ensued, with questions centering around possible changes in the entrance and lobby, installation of an elevator, improvements to the third floor (a badly executed addition to the original two-story building), and widening of the corridors. None of those present had been consulted in planning the reconstruction. Several individuals expressed doubt that the old hesed could be transformed into an effective building; others said that given the reality of its location in an area ill-served by public transportation, it was not worth the cost of modernization. Although no one seemed confident about the future, hesed staff said that almost all services to clients were being maintained for now in the temporary building, which is in the same district as the old structure. The hesed currently serves 10,680 clients, 5,200 of whom are eligible for services provided by the Conference on Jewish Material Claims against Germany. As is true elsewhere in Ukraine, the number of Claims Conference clients is diminishing annually as Holocaust survivors die. About 1,500 clients (of the total 10,680) reside in Kyiv oblast (region), outside of the city itself. Approximately 4,200 clients receive smart cards that enable them to purchase groceries and medicines at a discount in certain supermarkets and pharmacies. Another 220 people use JDC-issued debit cards, a practice that will replace the smart cards as local financial institutions develop appropriate technology infrastructures. Patronage services (home health care) are extended to 1,191 recipients of Claims Conference benefits and 338 non-recipients. At least 500 more people need home health care, said staff, but they are ineligible for Claims Conference funding and JDC lacks resources to provide such care to these individuals. Twenty-two people receive meals-on-wheels through the hesed. Additional Jewish elderly need this service, said hesed staff, but funding is not available to expand its availability. In addition to these regular benefits, JDC has secured certain one-time special grants from various sources for distribution as a "13th month" allowance in this time of extreme economic stress in Ukraine. Hesed staff also has received a one-time 20 percent salary supplement. The senior adult day program continues at the temporary hesed, serving 326 clients who come in groups of 25 once or twice monthly. The number of client visits depends on many factors, one of which is the ability of the hesed to secure volunteer assistants to help in management of the program. Clients are picked up at their homes in the morning and returned in the late afternoon by special vans; while at the hesed, they engage in various social activities, make appointments for medical care, receive hairdressing services, and consume one or more hot meals. Holidays are celebrated, and occasional excursions are offered to museums, botanic gardens, and similar attractions. The hesed also offers various club activities to senior adults. Members of a hesed choir perform before a day center audience in the temporary hesed premises. Refreshments await all after the performance. In addition to helping Jewish elderly, JDC also assists approximately 1,000 at-risk Jewish families, stated JDC staff. About 400 of these families receive occasional food parcels, medicines, and/or winter relief (warm clothing, blankets, etc.). Children from about 600 families participate in JDC Jewish holiday celebrations and/or attend Sunday school programs. A Pesach festival is to be held in April at a site outside Kyiv for families receiving JDC services. One staff member said that a new priority for JDC in working with at-risk families should be the development of programs for mothers in these families; most of these women are single parents, she said. They are under enormous stress, even in normal times, and many feel abandoned and lonely. In response to a question, JDC staff said that the organization does not operate any programs for special-needs children in Kyiv. However, said one professional, JDC in Lviv operates a residential camp for 40 families with special-needs children. This year, JDC created flash mobs in the streets of Kyiv, handing out Purim goodie baskets to passers-by, all of whom seemed very happy to receive these unexpected gifts from strangers. JDC organizes a Jewish family camp during the summer months, aiming to attract middle-class families into Jewish life. All families must pay a significant portion of the total cost. However, operation of the camp in 2014 is uncertain because it had been scheduled for a resort area in Crimea that now probably is inaccessible to Ukrainians following its occupation by Russia. 78. As noted previously, Rabbi Moshe Asman of the Main Choral Synagogue (Brodsky) and Rabbi Mordechai Levenhartz of the Simcha school and synagogue operate their own welfare programs, reaching additional hundreds of needy Jews. Rabbi Levenhartz coordinates his welfare work with Hesed Azriel. The Masorti movement and Rabbi Bleich's Main Choral Synagogue (Karlin-Stolin) are within easy walking distance of each other, and Rabbi Stamov and Rabbi Bleich enjoy cordial relations. The Progressive/Reform premises, although also in Podil, are located at some distance from Masorti and from the Main Choral Synagogue, and Rabbi Dukhovny's relationship with Rabbis Stamov and Bleich are strained. Another feature is a mikveh for performing Progressive conversions. The mikveh is a shower stall. The two preschools are open to all children regardless of religious identification. Parents must sign forms indicating their acceptance of a small amount of Jewish programming in the curriculum. See the writer's Observations on Jewish Community Life in Ukraine - Report of a Visit in April 2013, pages 27-28, about the Progressive congregation in Odesa. For information about the JDC administrative center in Kyiv, see page 121. The building had been planned as a preschool; hallways and other space had been designed to accommodate the needs of small children.